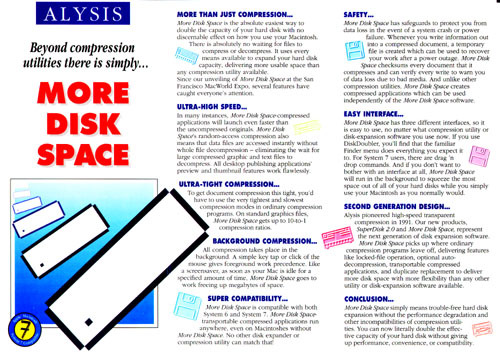 More Disk Space™ 1.0 was launched in 1992 with news coverage in MacWEEK and MacWorld magazines. The software was sold via Alysis Software Corporation's already established distribution channel. Alysis Software Corporation introduced the software at the MacWorld Exposition in San Francisco. Alysis' booth towered fourteen feet tall and sported four video columns, each housing a separate demonstration. With the introduction of More Disk Space™, Alysis revamped the look of its products' packaging, documentation, and promotional material. White space, pastels and drop shadows replaced the subdued tone of earlier packaging. Alysis became more involved in the online community, establishing a forum on America Online. By talking with hundreds of its products' users, the company was able to gather feature requests and bug reports more rapdily and effectively. The online presence also permits the company to give live chat sessions to answer questions about its products.